Kids' Corner - Welcome to KFMB! Recycling means taking materials from old discarded materials and making new products from them. Recycling or making new things from recycled ones takes a lot less money and less energy. It also saves a lot of the Earth’s natural resources, thereby helping the environment. Recycling also helps save space in landfills. Instead of your family's garbage being thrown away and taking up space and damaging the environment it’s always better to recycle it. The energy saved by recycling also results in less pollution and we all know how bad pollution is to our environment. When you make new products from old but still useful materials think about the natural resources that are saved because of the material from old products that would otherwise have been thrown away. 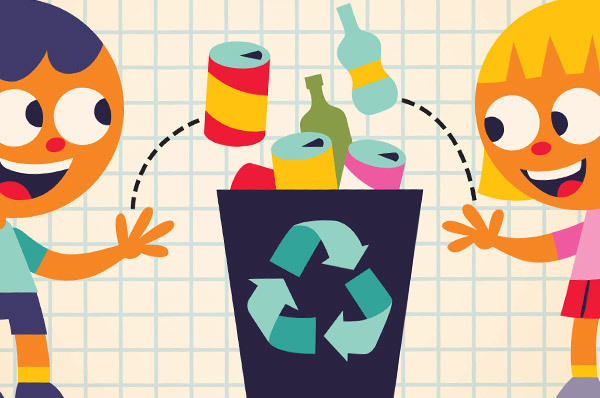 Paper, glass, plastic bottles, cardboard, aluminum cans, steel cans, and other metals can all be recycled. These products can be used to make playground equipment, the steel in skyscrapers, bottles that hold food other household products, and even bottles for drinking water. Step 1: Fold each brown lunch bag in half. Punch two holes along the folded edge of the bags. Step 2: From the back, insert the rubber band through each hole. Insert a craft stick through one loop of the rubber band and then through the other loop. Step 3: Create the turkey face. Cut a yellow triangle for the beak. From the red construction paper cut the turkey’s wattle. Add googley eyes. Step 4: Create the tail feathers by cutting a feather shape from recycled paper or magazine pages. Step 5: Glue the tail feathers to to the back of the last page of the book. Cut a piece of brown cardstock paper a little bit larger than the size of the book to cover the back of the tail feathers and help support them. Step 6: Illustrate your book. Add drawing and writing to the inside pages of the book. 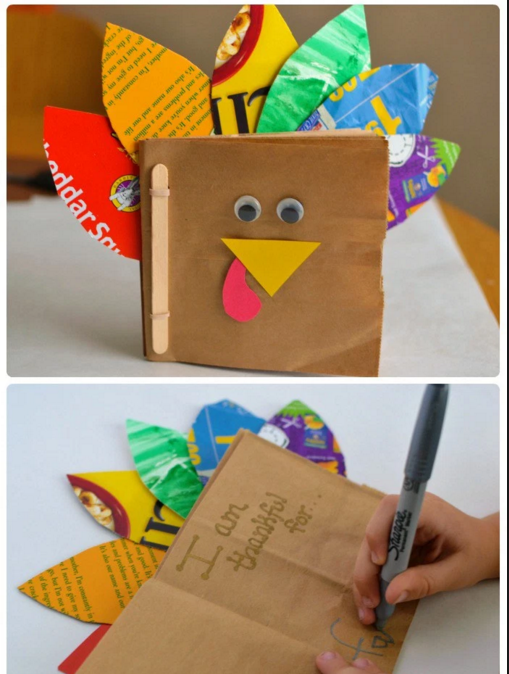 Write about what you are thankful for or tell your own turkey story! Thanksgiving is a fun time to create and craft together as a family. 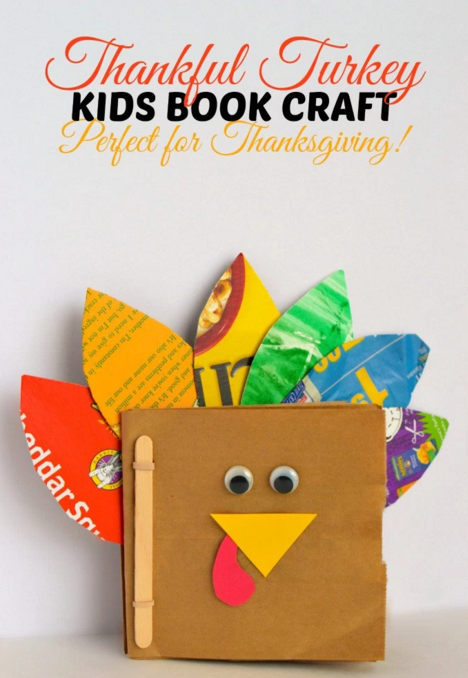 A thankful turkey book would be a great family keepsake to look back on each year. Add photographs of your Thanksgiving day meal or photos of your family Thanksgiving traditions to record your favorite memories.